I want to introduce you to all of our babies! 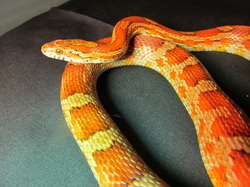 We own cornsnakes, ball pythons and a pair of red tail boas! This is Niobe, Persephone's sister! 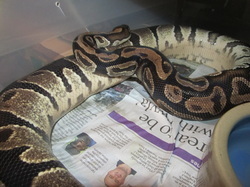 She's a Classic possible het Hypo Cinder! This is Persephone. She's a hypo. She's also possibly het cinder! This is Copper! 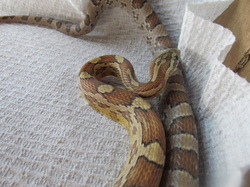 Copper is a classic corn het Motley and Amel. She's also possibly het Caramel. The is Amelia! 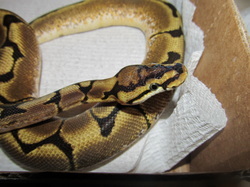 She's an Amel het Motley, hypo, anery. caramel, dilute! 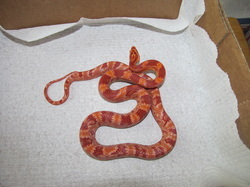 2010 Classic possible het Hypo Cinder. Thantos doesn't like to pose for pictures so here's the best shot of him! This is Dream! 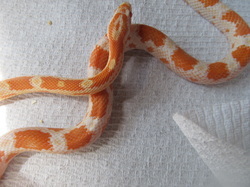 She's a creamsicle(Amel Corn snake X Albino emery rat snake) het stripe! Meet Rolo! 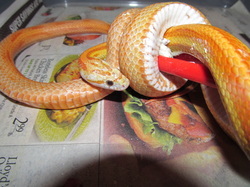 He's a Dilute Caramel het Amel, Anery, Motley, and hypo! This is Golddie! She's a lovely Golddust Motley! This is Suzzie Q. Q for short. As you can see she's a feisty little girl and a great eater! 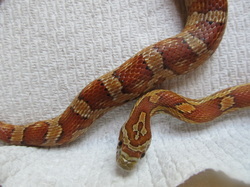 She's a pretty little ultramel stripe het caramel! 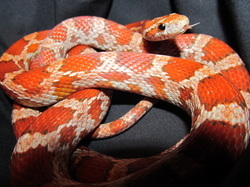 Milksnake got her name because she was being sold as a Milk snake!! WE were told she was het diffused and ph Anery. So far we've proved her out to be het anery and het hypo! 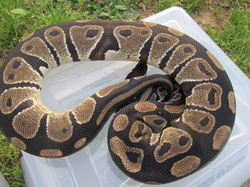 We'll be breeding her soon to test out the het diffused! I got this guy when I got the Anery above. He's very light. 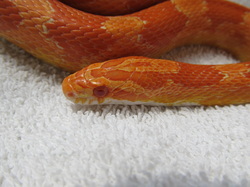 We proved this guy out as Het Hypo! 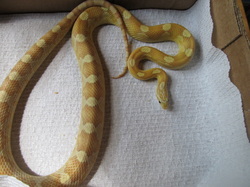 This is our amazing pastel. 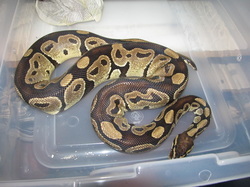 He's one of our first ball pythons and has amazing color. 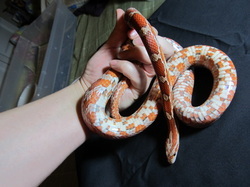 He's a fantastic breeder and sweet snake. One of a beautiful normal girls. 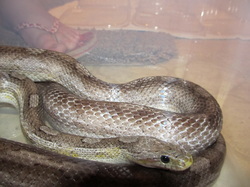 She's a very light snake and is very curious! This is Big Momma! 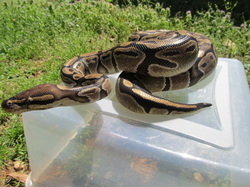 She's a great girl and she laid 8 eggs for us this year! This is is a Big BABY~ He's the sweetest thing and does a great job around kids! This is Monster! 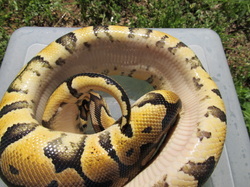 He's a Spider ph pied! When we first got him I noticed that the markings around his mouth looked like teeth! He got the name Monster from his big scarey "teeth!" but he is truly a sweetheart!